I have not spent a lot of time searching out or drinking wine from Australia. When I do think about wines from Australia I think of Shiraz. There are many varietals produced. The largest red varietal produced is Shiraz with Cabernet Sauvignon following Merlot. Of the whites produced Chardonnay is first with Semillon second following Sauvignon Blanc and finally Riesling. Wines are often labeled with the name of their grape variety, which must constitute at least 85 percent of the wine. Australia is the fourth largest country to export wine in the world, shipping approximately 750 Million Liters of wine. The country only consumes 40% of the wine. Wine is produced in every state, with more than 60 designated wine regions totaling approximately 160,000 hectares (a hectare is ~2.5 US acres); however Australia’s wine regions are mainly in the southern, cooler parts of the country, with vineyards in South Australia, New South Wales, Victoria, Western Australia, Tasmania, and Queensland. The wine regions in each of these states produce different wine varieties and styles that take advantage of the particular terroir such as climatic differences, topography and soil types. Medium color depth with a brick colored hue. 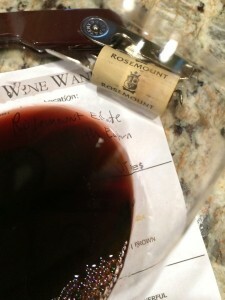 The Cabernet is showing age even though the vintage is relatively young. Moderate aromas showing middle-age. Notes of dark fruit including plum. Dry, medium-bodied with balanced acidity. The tannins were weak and soft. Silky savory rich mouth-feel with a long flavorful finish. How much: It was a gift. 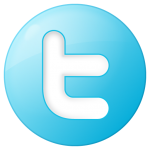 Retail on-line was around $8.00 – $12.00 per bottle. The on-line ratings give the wine an 87 rating. I chose a higher rating because of the value. How do you pay $10 for a bottle of wine that is really tasty? 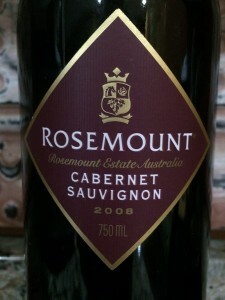 I rated the 2008 Rosemount Estate Diamond Label Cabernet Sauvignon four glasses. At this price I would not hold the wine, I would drink it.